My CLA just went into the dealer service dept today for the apple carplay/Android auto retrofit. Hopefully the installation goes well. Its going in at the same time for the B service and some other Misc stuff. Okay, got my CLA back today, after having been in the MB service shop for overnight. They completed the Service B work, and successfully installed and integrated the apple CarPlay and Android Auto into the command system. First off, I activated the Android auto, I have to say it works fine, except that I still need to figure out how to use Android auto. It looks really cool , especially when a text message comes in. So there it is, the MB retrofit kit works. Now to go get myself an iPhone. I'm just looking the new CAPMB-51 by CRUX Interfacing. It’s a tool that allows you to recodes NTG 5.1 by yourself in 30 seconds using the ODB port. It will enables CarPlay, Mirrorlink and Android Auto in one shot. It's on sale at $ 299 on some stores. 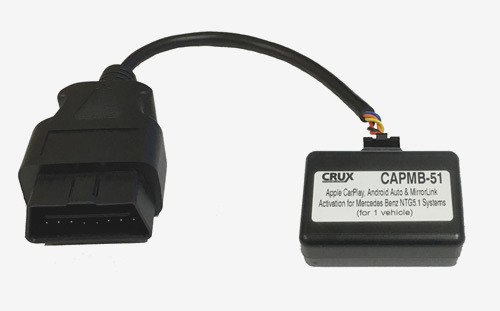 CarPlay and Android Auto require the A2468203800 USB panel in order to work with the mobile phone. For Audio20 systems built before December 2015, it's required a firmware update by car dealership. Some of you have already purchased and used? I got my CarPlay installed at dealer , for only $250.00, labour and parts. Why go aftermarket when OEM costs less? Reading this service page, it seems that Audio 20 have no chance with CarPlay. I think the only way to have CarPlay is to replace NTG Audio 20 with a Comand one...isn't it? Yes, you are correct. I didn't realize your car didn't have Navi. On the Command system. You will need to have the COMMAND NTG5 system software in order to integrate the CarPlay. But if you do, it only cost $250 to install retrofit kit , from MB dealer. I have just asked about this retrofit with the dealer and they will be getting the software/parts for installation next week around Tuesday. They said once they have it, they can install and integrate it in an hour or two. I'm looking forward to this retrofit done and using Android Auto. Will update next week about how it goes. A bit offtopic but just to warn you, I've just received a CAPMB-51 HW 1.0 SW 1.0 and used it in an W176 with Audio 20 (manufacture date 05/2016, EU firmware) and it did nothing, the headunit entered DIAG mode and the process was apparently successful, but no Carplay, Andorid Auto or Mirrolink where activated. I asked twice to Crux whether it would work on an EU unit, and asked them after using it if there's anything that could be done but I got no response so far. Thought one needed comand not audio20 for those updates to work?